WALLKILL—A much anticipated road that connects busy shopping centers in the town of Wallkill officially opened on Thursday. 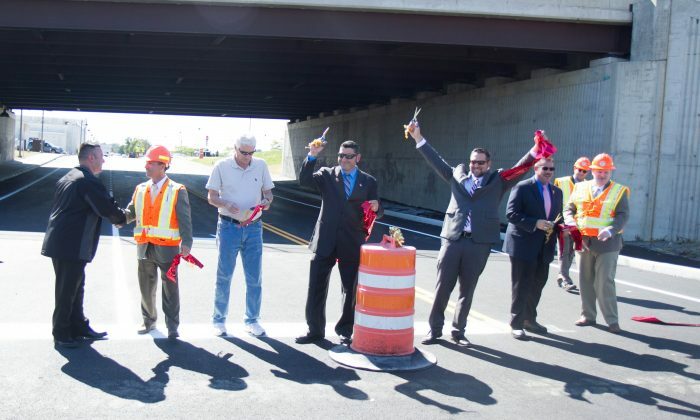 Officials from the state and town attended a ribbon cutting for the road, which travels under Route 17 and connects the shopping centers of Orange Plaza, the Galleria at Crystal Run mall, and Dunnings Farm. The road offers a shortcut between the shopping centers that prevents traffic from having to use Route 211. Now Schutt Road extends from the intersection with Dunning Road (County Route 92) to North Galleria Drive. It will not only make it easier for people to shop in the area, officials said, but alleviate congestion on Route 211. As part of the project, Schutt Road was repaved, new street and traffic lights were installed, a sidewalk on one side put in, and new lines painted on the road. Wallkill Commissioner of Public Works, Lou Ingrassia, says the addition to the road satisfies a safety concern as well. ‘This gives you a separate means of ingress [and] egress,” he said in reference to an emergency situation. The project started in 2002 when John Ward was the town supervisor and he made sure to be there for its opening. He said the $5.4 million project was at a roadblock due to funding, and it wasn’t till they got funding through the federal government that they were able to make it happen.